the National Defense Authorization Act for Fiscal Year 2000, Public Law 106-65, provides that the Secretary of Defense shall submit a report “in both classified and unclassified form, on the current and future military strategy of the People’s Republic of China. The report shall address the current and probable future course of military-technological development on the People’s Liberation Army and the tenets and probable development of Chinese grand strategy, security strategy, and military strategy, and of the military organizations and operational concepts, through the next 20 years. Taking into account the post-Cold War, pre-9/11 context in which this legislation was enacted, as well as China’s annual military spending increases that surpassed 10% annually for most years between 1997 and now (see Fig. 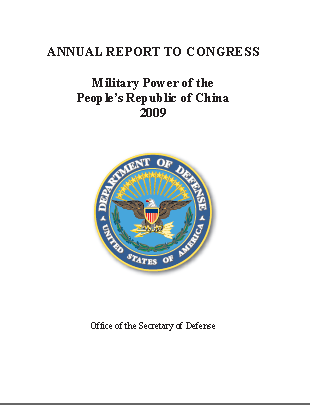 10, p. 34, in the 2009 report), it’s not that hard to imagine why China’s increasing military power would have been a topic of some concern to the lawmakers who drafted the FY2000 NDAA and included this annual report as a requirement for the DoD. Indeed, with the PLA’s military modernization having continued unabated in the ensuing decade, the decision to “statutize” the requirement for this report looks to me to have been a pretty good call. I have read that the release of this year’s report has been delayed for strategic reasons, e.g. the U.S. doesn’t want to tick off the Chinese any more while they are still simmering about Taiwan weapons sales and President Obama’s decision to allow a visit with the Dalai Lama at the White House in February, which makes sense. One “milestone” that reportedly was part of the calculus about the release date of the report was whether or not China’s President Hu Jintao would attend a meeting on nuclear security in Washington later this month…looks like you can count him in. The conference dates are April 12 – 13, and afterwards Hu will visit a few South American countries, including Brazil, Venezuela and Chile. Therefore, I would wager that it’s pretty firm that the Pentagon report won’t be released until after Hu’s visit to Washington. One news report I read even said that the PRC military power report might be delayed until May. Why do I want to read this report so badly? It’s a veritable goldmine of information about China’s military capabilities and modernization, and although as a public document, it won’t contain any of the really juicy sensitive information that might be contained in a classified version, it still is a good yardstick to see what “Big Pentagon” thinks about China’s military and I would like to see what has changed in the Pentagon’s assessment in the course of a year, if anything. Based on last year’s report, which gave prominent attention to China’s growing asymmetric and anti-access capabilities, I would imagine there will be even more about these issues, including anti-satellite (ASAT) weapons, anti-ship ballistic missiles (ASBM), and computer network operations (CNO), which I mentioned in my last post as things that interest me with regard to Taiwan Strait security and the regional balance of power. This entry was posted on April 1, 2010 at 8:52 pm and is filed under China. You can follow any responses to this entry through the RSS 2.0 feed. You can leave a response, or trackback from your own site. China will rules the world by economic powers. Thanks for your comment. Many Western China analysts, prominent among them David Lampton, have argued that the economic arena is China’s chosen field of competition and that the Western fixation with hard power (military power) is, to paraphrase, wrong game, wrong field, wrong team. As a military professional, the hard power arena is my main area of interest, but as you indicated, China does not see military power as their primary means of asserting strength (at least not at this time; China will likely spend another decade or so focusing on economic development, but many feel that after 2020 or so China will shift its focus to building its military power and power projection capacity).